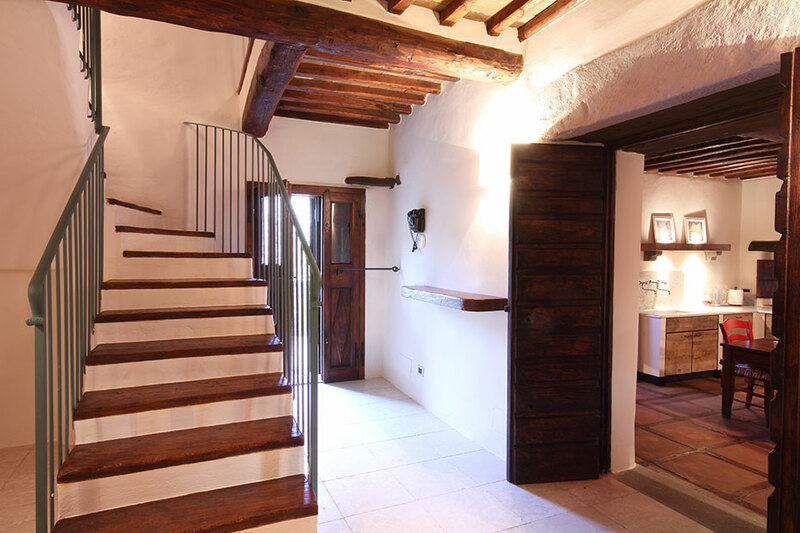 The villa is entered into a small hall. 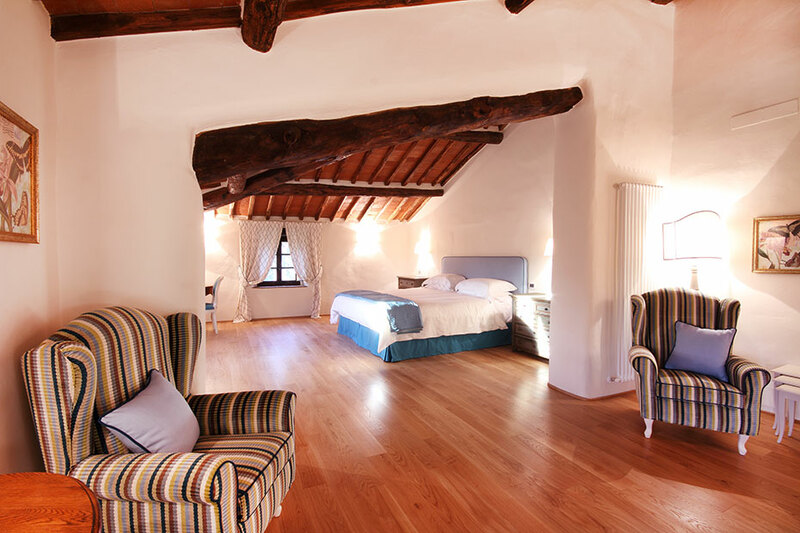 Like the rest of the villa, it has a tradition Tuscan villa ceiling of terracotta tiles and wooden beams. It's furnished with several antique pieces. Off this is a bathroom with a Victorian bath with handheld shower fitting, there is also a separate shower. 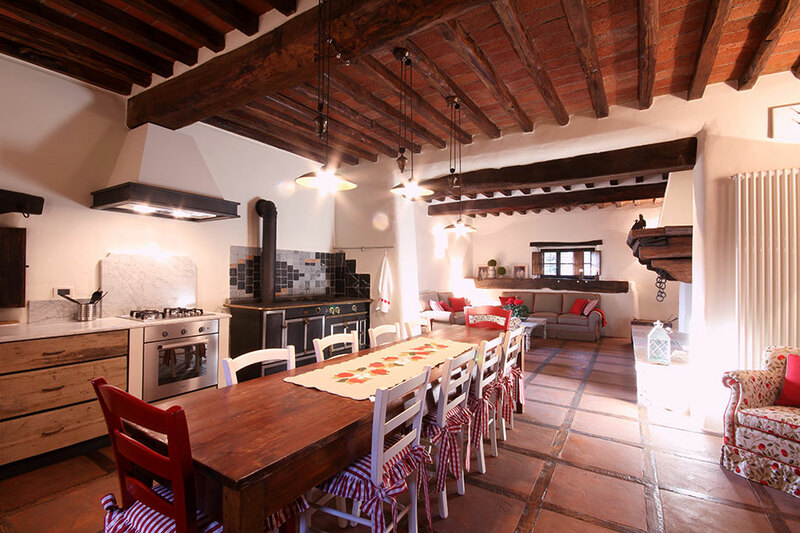 Off the room and down a couple of steps is the large kitchen which has a pretty floor of terracotta and wood. Along two walls is the kitchen unit, which has induction plates, an oven and dishwasher, the large double fridge/freezer is in a small pantry off the kitchen. A tradition wood burning stove is to one side, this cannot be used. In the centre of the room is a long wooden table which can seat 10 people. Off the pantry is a laundry and a w.c. 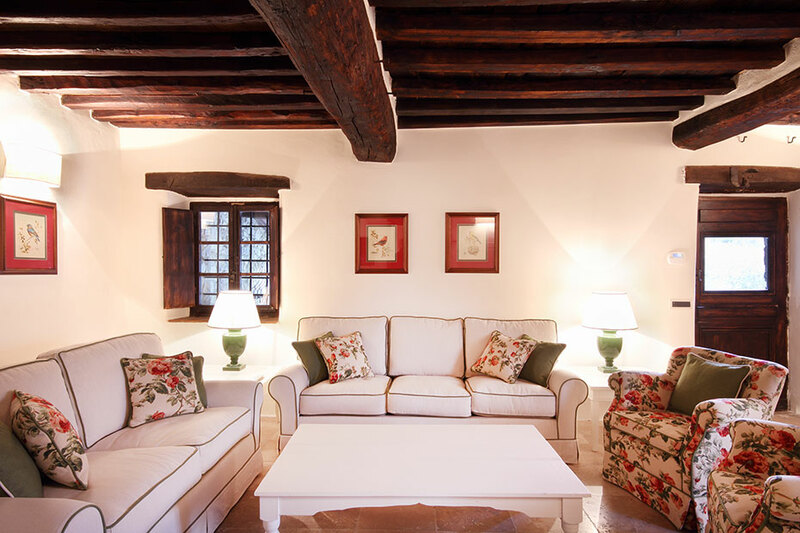 Passing under a wooden arch is a lounge, furnished with a triple and double sofa plus an armchair. 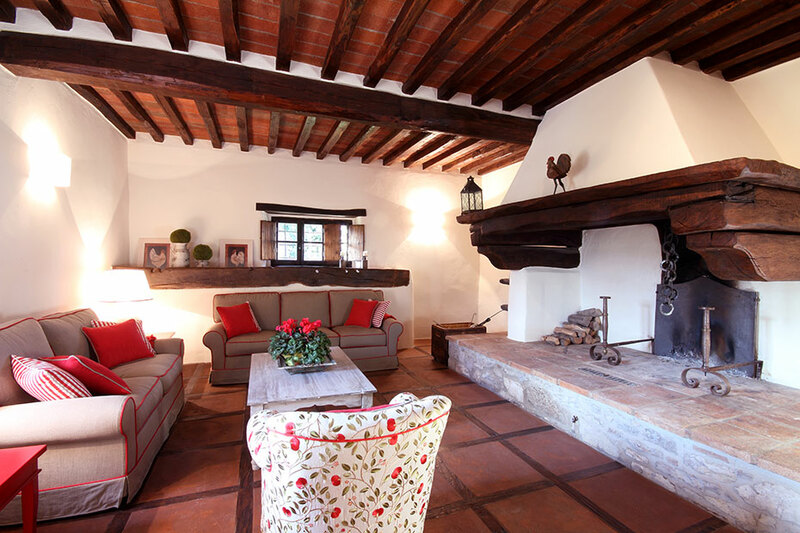 These are huddled around a large, original Tuscan fireplace which can be used on the colder days in Winter. 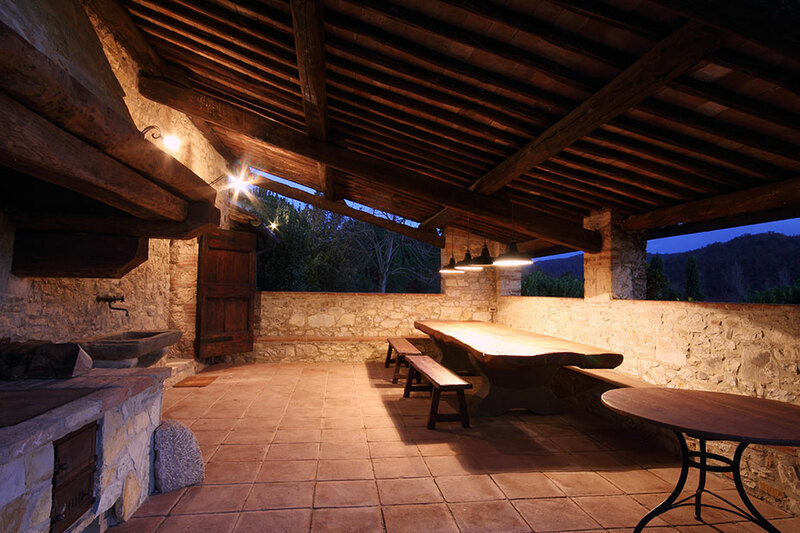 Between the kitchen and pantry there is a door out to the large, covered loggia which is furnished with a huge long table with benches and lights above it. To one side is a large fireplace to barbeque, next to this is a stone sink. This is a fantastic place for dining. 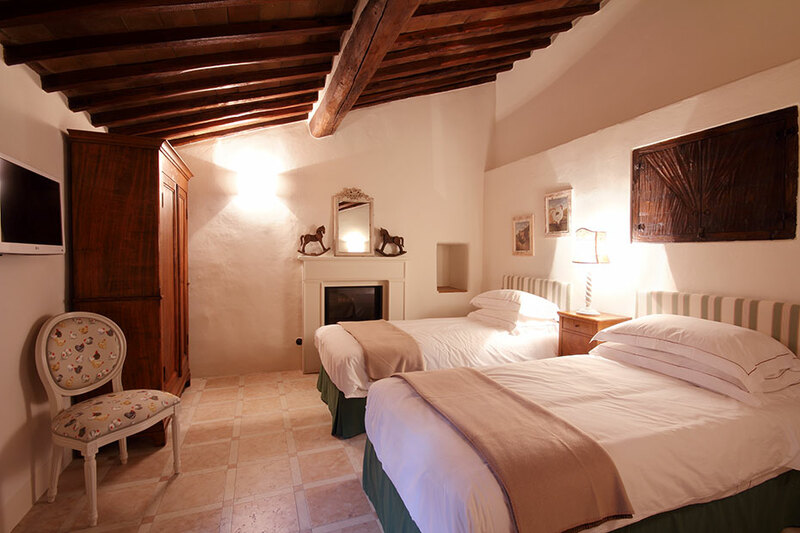 Over the low stone wall around the loggia there are views of the pool, garden, vineyards and olive groves. 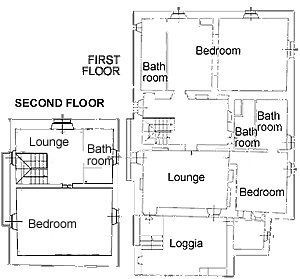 On the ground floor there is a bedroom which is in a small detached annex. The room can be accessed by some external stairs which lead onto a small internal balcony or from a door from the garden. Inside there is a little hall of which is a bathroom with shower, and a pretty double bedroom furnished with a TV, a wardrobe, a chest of drawers and a writing desk. From the entrance hall there are stairs to the first floor, where there is a landing. Off this to the left is a huge suite done in white and turquoise. It has a lovely wooden floor and furnished with a triple wardrobe, a couple of armchairs, TV, chest of drawers and a large double bed. Off the back of the room is a spacious bathroom with large shower. To the right of the landing is a second lounge which has a tv. It has a lovely travertine floor and is furnished with a triple and double sofa and two armchairs. 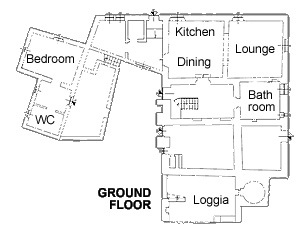 From this room there is access to a small loggia. Off the lounge is a twin bedroom done in white and green. There is a small TV and wardrobe. In the room is a decorative fireplace. En-suite is a big bathroom with large shower. From the landing and up some wooden stairs there is the tower floor. Immediately at the top of the stairs there are several armchairs and immediately in front is a glass enclosed bathroom with shower. 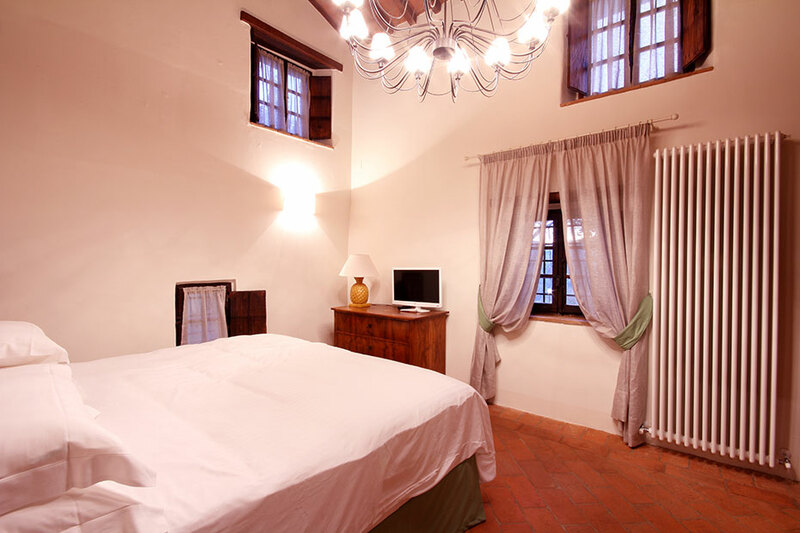 From this little room there is a bedroom with a king-size double bed. The room has a couple of armchairs around a coffee table and a wardrobe. Like the other bedrooms it also has a TV.